That Was the Week That Was, informally TWTWTW or TW3, was a satirical television comedy programme on BBC Television in 1962 and 1963. It was devised, produced and directed by Ned Sherrin and presented by David Frost. An American version by the same name aired on NBC from 1964 to 1965, also featuring Frost. The programme is considered a significant element of the satire boom in the UK in the early 1960s. It broke ground in comedy through lampooning the establishment and political figures. Its broadcast coincided with coverage of the politically charged Profumo affair and John Profumo, the politician at the centre of the affair became a target for derision. TW3 was first broadcast on Saturday, 24 November 1962. Cast members included cartoonist Timothy Birdsall, political commentator Bernard Levin, and actors Lance Percival, who sang topical calypsos, many improvised to suggestions from the audience, Kenneth Cope, Roy Kinnear, Willie Rushton, Al Mancini, Robert Lang, David Kernan and Millicent Martin. The last two were also singers and the programme opened with a song – "That Was The Week That Was" – sung by Martin to Ron Grainer's theme tune and enumerating topics in the news. Frankie Howerd also guested with stand-up comedy. Script-writers included John Albery, John Antrobus, John Betjeman, John Bird, Graham Chapman, John Cleese, Peter Cook, Roald Dahl, Robin Grove-White, Richard Ingrams, Lyndon Irving, Gerald Kaufman, Frank Muir, David Nobbs, Denis Norden, Bill Oddie, Dennis Potter, Eric Sykes, Kenneth Tynan, and Keith Waterhouse. The programme's title is believed to be a conscious echo of the Shell Oil advertising slogan "That's Shell – That Was! ", widely used on posters from the early 1930s onwards (implying that a Shell-powered vehicle was out of sight in an instant). 1963 Radio Times cover promotes the return of the programme for a second series. The programme opened with a song ("That was the week that was, It's over, let it go ...") sung by Millicent Martin, referring to news of the week just gone. Lance Percival sang a topical calypso each week. Satirical targets, such as Prime Minister Harold Macmillan and Home Secretary Henry Brooke were lampooned in sketches, debates and monologues. Some other targets included the monarchy, the British Empire, nuclear deterrence, advertising, public relations and propaganda, capital punishment, sexual and social hypocrisy, the class system, and the BBC itself. Well-remembered sketches include a controversial "consumers' guide to religion", which discussed relative merits of faiths in the manner of a Which? magazine report, which received controversy from religious figures at the time. The programme was not party political but did not treat all issues with what the producers considered to be a false level of impartiality and balance; one example of this is the issue of racism and "the evils of apartheid", following the view of BBC Director-General Sir Hugh Greene that the BBC should not be bound by its charter to be impartial on issues of racism, which Greene and the producers of TW3 viewed as "quite simply wrong". Following the 1963 murder of 35-year-old white postal worker William Lewis Moore in Alabama, who was on a protest march against segregation in the American South, TW3's Millicent Martin dressed as Uncle Sam sang a parody of "I Wanna Go Back to Mississippi" ("... where the Mississippi mud/kinda mingles with the blood/of the niggers who are hanging from the branches of the tree ...") accompanied by minstrel singers in blackface ("... we hate all the darkies and the Catholics and the Jews / Where we welcome any man / Who is strong and white and belongs to the Ku Klux Klan"), thus parodying The Black and White Minstrel Show, which was then being shown on the BBC despite accusations of racism over its use of blackface. On Saturday, 20 October 1962 the award of Nobel prizes to John Kendrew and Max Perutz, and to Francis Crick, James D. Watson, and Maurice Wilkins was satirised in a short sketch with the prizes referred to as the Alfred Nobel Peace Pools; in this sketch Watson was called "Little J. D. Watson" and "Who'd have thought he'd ever get the Nobel Prize? Makes you think, doesn't it". The germ of the joke was that Watson was only 25 when he helped discover DNA; much younger than the others. TW3 was broadcast on Saturday night and attracted an audience of 12 million. It often under- or overran as cast and crew worked through material as they saw fit. At the beginning of the second season in the autumn of 1963, in an attempt to assert control over the programme, the BBC scheduled repeats of The Third Man television series after the end of TW3. Frost suggested a means of sabotaging this tactic to Sherrin, and he agreed. For three weeks, Frost read out the plot of The Third Man, until the repeats were abandoned following the direct intervention of Greene. For the edition on Saturday, 23 November 1963, the day after the assassination of United States President John F. Kennedy, TW3 produced a shortened 20-minute programme with no satire, reflecting on the loss, including a contribution from Dame Sybil Thorndike and the tribute song "In the Summer of His Years" sung by Martin with lyrics by Herbert Kretzmer. This edition was screened on NBC in the US the following day, and the soundtrack was released by Decca Records. A clip, featuring Roy Kinnear, was shown in the David L. Wolper documentary film Four Days in November and on the History Channel 2009 documentary JFK: 3 Shots that Changed America. In addition to the Millicent Martin studio recording of "In the Summer of His Years" issued in the US by ABC-Paramount, other versions were recorded and released by Connie Francis (MGM), Mahalia Jackson (Columbia), Kate Smith (RCA Victor), Sarah Vaughan (Vernon) and The Chad Mitchell Trio (Mercury); the Francis recording became a Top 40 hit on the Cash Box pop singles chart in January 1964. BBC presenter Richard Dimbleby, who broadcast the president's funeral from Washington, said the regular programme was scrapped when news of the assassination was received and that the programme was a good expression of the sorrow felt in Britain. After two successful series in 1962 and 1963, the programme did not return in 1964. The reason given by the BBC was that 1964 was an election year and political material could compromise the corporation's impartiality. Prime Minister Harold Macmillan was initially supportive, chastising the Postmaster General Reginald Bevins for threatening to "do something about it". However, the BBC received many complaints from organisations and establishment figures. Lord Aldington, vice-chairman of the Conservative Party, wrote to the BBC's director-general Hugh Carleton Greene that Frost had a "hatred" of the Prime Minister, which "he finds impossible to control". The programme also attracted complaints from the Boy Scout Association, upset by an item questioning the sexuality of its founder Lord Baden-Powell, and the government of Cyprus, which claimed that a joke about Archbishop Makarios, the country's ruler, was a "gross violation of internationally accepted ethics". 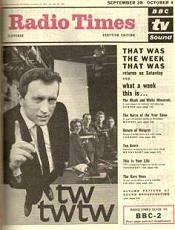 TW3 was live and recordings were not made of all editions, although only two editions are missing; the first pilot, and the 13 April 1963 edition. A compilation of surviving material was shown on BBC Four to celebrate the 40th anniversary. In a list of the 100 Greatest British Television Programmes up by the British Film Institute in 2000, voted by industry professionals, That Was The Week That Was placed 29th. Sherrin attempted to revive the formula with Not So Much a Programme, More a Way of Life but was less successful. An American version was on NBC, initially as a pilot episode on 10 November 1963, then as a series from 10 January 1964 to May 1965. The pilot featured Henry Fonda and Henry Morgan, guests Mike Nichols and Elaine May, and supporting performers including Gene Hackman. The recurring cast included Frost, Morgan, Buck Henry and Alan Alda, with Nancy Ames singing the opening song and Stanley Grover and Ames performing solos and duets; regular contributors included Gloria Steinem, William F. Brown, Tom Lehrer and Calvin Trillin. The announcer was Jerry Damon. Also a guest was Woody Allen, performing stand-up comedy; the guest star on the final broadcast was Steve Allen. A running gag was a mock feud with Jack Paar, whose own programme followed TW3 on the NBC Friday schedule; Paar repeatedly referred to TW3 as "Henry Morgan's Amateur Hour". The American version is largely a lost program, although the pilot survives and was donated to the Library of Congress by a collector. Amateur audio recordings of most episodes also survive. After the series' cancellation, Lehrer recorded a collection of his songs used on the show, That Was The Year That Was, released by Reprise Records in September 1965. In the American version, an episode showed a smiling U.S. President Lyndon B. Johnson contemplating an easy 1964 campaign against the Republican nominee, U.S. Senator Barry M. Goldwater of Arizona. The satirists sang that Goldwater could not win because he "does not know the dance of the liberal Republicans", then a substantial component of the GOP, many of whose members had supported Governor Nelson A. Rockefeller of New York for the Republican nomination. On April 21, 1985 in the United States, the ABC network aired That Was The Week That Was as a special, hosted by David Frost (also serving as an executive producer) and Anne Bancroft, and featuring future Saturday Night Live cast members Jan Hooks and A. Whitney Brown and puppetry from Spitting Image. Kristy Glass and Kevin Ruf starred in a remake of TW3 for ABC's Primetime Live in the fall of 2004. Soon after its premiere, Shelley Ross, the executive producer, was fired and TW3 ended with her dismissal. A Canadian show, This Hour Has Seven Days, aired from 1964 to 1966 on CBC. Although partially inspired by That Was The Week That Was, the Canadian show mixed satirical aspects with more serious journalism. It proved controversial and was cancelled after two series amid allegations of political interference. This Hour Has 22 Minutes, created by Newfoundland comic Mary Walsh, has been running since 1992 although the two are not related. An Australian show, The Mavis Bramston Show, aired from 1964 to 1968 on the Seven Network. It grew out of the recent local theatrical tradition of topical satirical revue—most notably the popular revues staged at Sydney's Phillip Street Theatre in the 1950s and 1960s—but it was also strongly influenced by the British satire boom and especially TW3 and Not Only... But Also. The New Zealand show A Week Of It ran from 1977 to 1979, hosted by Ken Ellis, and featuring comedians David McPhail, Peter Rowley and Chris McVeigh and comedian/musicians Jon Gadsby and Annie Whittle. The series lampooned news and politics and featured songs, usually by McPhail and Gadsby, who continued with their own show, McPhail and Gadsby in similar vein. A Dutch version, Zo is het toevallig ook nog 's een keer, aired from November 1963 to 1966. It became controversial after the fourth edition, which included a parody of the Lord's Prayer ("Give us this day our daily television"). Angry viewers directed their protests especially against the most popular cast member: Mies Bouwman. After receiving several threats to her life she decided to quit the show. The show was praised as well: in 1966 it received the Gouden Televizier-ring, a prestigious audience award—though it turned out afterward that the election was rigged. An Indian version titled The Week That Wasn't was launched and hosted by Cyrus Broacha. Cleveland, Ohio, local personality Ghoulardi (played by Ernie Anderson), host of WJW-TV's Shock Theater in the 1960s, ran clips of local celebrities and politicians and satirised them in a Shock Theater segment entitled That Was Weak Wasn't It? ^ McCann 2006, p. 156. ^ Rees, Nigel (1987). Why do we Say ... ? words and sayings and where they come from. Poole: Blandford Press. p. 147. ISBN 0-7137-1944-3. ^ a b Hegarty 2016, p. 55. ^ Briggs, Asa (1995). The History of Broadcasting in the United Kingdom: Competition. Oxford University Press. p. 361. ISBN 978-0-19-215964-9. ^ a b Strinati, Dominic; Wagg, Stephen (24 February 2004). Come on Down? : Popular Media Culture in Post-War Britain. Routledge. p. 267. ISBN 978-1-134-92368-7. ^ Hegarty 2016, p. 65. ^ "BBC marks TW3 anniversary". BBC News. 26 November 2002. ^ Hastings, Chris (17 June 2007). "Tories helped take TW3 off the air". The Daily Telegraph. ^ a b McCann 2006, pp. 313–314. ^ "TV Trends: Conspicuous Cameras". Image Dissectors. 2010-06-08. Retrieved 2013-09-01. ^ Gardner, Paul (January 3, 1964). "ORIGINATOR HERE TO ASSIST 'T.W. 3' / David Frost Will Appear on New Satirical Revue". The New York Times, p.49. Retrieved November 19, 2018. ^ "Morse for 'T.W. 3'" (The New York Times, January 20, 1964, p.87). Retrieved October 27, 2018. ^ "• View topic - The Last Sundown for Cinesation: 2013 Fest Report". Nitrateville.com. Retrieved 2014-05-31. ^ "Lost and Found Sound: The Stories". Npr.org. Retrieved 2014-05-31. 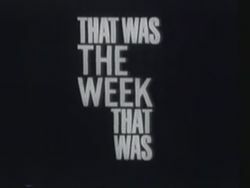 ^ "'THAT WAS THE WEEK THAT WAS (TV)'". Retrieved 5 November 2015. ^ Nijland, Yfke. "'Zo is het toevallig ook nog 's een keer'" (in Dutch). Geschiedenis 24. Retrieved 22 August 2013. ^ Watson, Elena M. (2000). Television Horror Movie Hosts: 68 Vampires, Mad Scientists and Other Denizens of the Late Night Airwaves Examined and Interviewed. Jefferson, North Carolina, United States: McFarland & Company. ISBN 0-7864-0940-1. Archived from the original on 2007-09-28. Retrieved 2014-05-31. Hegarty, Neil Hegarty (2016). Frost – That Was the Life That Was: The Authorised Biography. Ebury Publishing. ISBN 978-0-7535-5672-6.